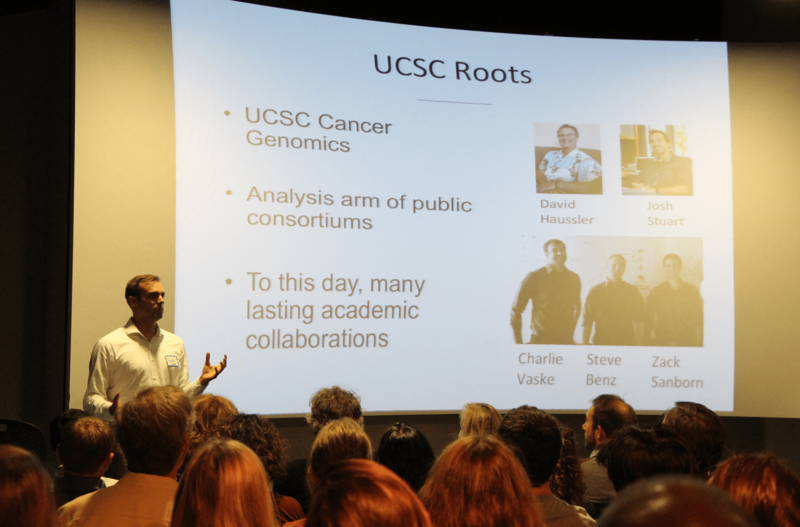 An overflow throng filled the theater of the Monterey Bay National Marine Sanctuary Exploration Center last Tuesday evening to hear about the race to publish the human genome and the challenge to keep it open source. Joining them were five engaging scientists and CEOs participating in a forum, billed as TED-style talks, who described the backstory, intrigue, application and future of genomics. The event was hosted by Santa Cruz Works. Haussler, professor of biomolecular engineering and scientific director of the UC Santa Cruz Genomics Institute, briefly outlined the historical work of scientists who discovered DNA. Posing the question that science might be able to sequence human DNA was dismissed as crazy, too difficult to try. Pioneering a scientific meeting in 1985 to ask the best minds of the day to revisit that question was Robert L. Sinsheimer, Chancellor Emeritus of UC Santa Cruz. Five years of debate propelled the launch of the Human Genome Project in 1990, public and international in scope. The research would embody a constant creation of new technology inventing the future. As work progressed, however, private company Celera was formed and discovered a faster way to sequence data. The public / private competition began. Haussler, invited to join the private group, declined after learning their business plan for human heritage: selling subscriptions and patenting genes. Instead, he enlisted university resources, acquired computers and the brightest minds he could find to write the code, more than 20,000 lines in all, to meet a deadline of June 26, 2000 for a joint announcement arranged by the White House. The public and private groups were to agree it was a tie. But, for a couple of weeks, it was more like limbo. The public collaborators planned to give their information to science. The private company planned to sell it. The stalemate remained unresolved. Then, the UC Santa Cruz team decided it was time to release the information and host the genome. On July 7, 2000 the genetic information became publicly available to the entire world. Jim Kent, who programmed the original code, continued work on the UCSC Genome Browser, which now receives 1.2 million daily page hits from researchers. Representatives from three local companies shared their diverse applications of genomic information. NantOmics — Charlie Vaske, CEO, studied gene finders as a grad student at UC Santa Cruz a decade ago, then started working on cancer genomes. “Cancer is not one thing, it’s a thousand things,” Vaske said. Because cancer is based on each person’s DNA, it is still very difficult to treat. NantOmics, expanding in Santa Cruz, sequences the DNA of tumors and blood, collects data on thousands of cases and delivers reports back to doctors. Their goals are to repurpose drugs, develop new drugs and propose novel therapies. New treatments will be targeted to an individual patient’s tumor and not other parts of his/her body or to anyone else’s tumor. Dovetail Genomics — Ed Green studied genomics and RNA biology and served as an associate professor at UC Santa Cruz. Dovetail launched commercially a week ago at a location near other biotech firms in Westside Santa Cruz and offers commercial sequencing-assembly service. Somagenics — Brian Johnston, CEO, moved his company from Palo Alto to Santa Cruz in 2001, a founding member of the Delaware Avenue biotech hub. Somagenics is an RNA technology company working on viral hepatitis and the healing of chronic wounds, especially in diabetic patients, using mesh therapy. Ravi Jain joined the Genomics Institute in June in the newly created position of managing director to address mission, income, transition to a new facility and collaboration with the community. He studied bioinformatics at UCLA and is the founder of cBio, a consulting firm providing software development and data analysis. Currently, the work of the Genomics Institute is spread across the university in different departments. Future plans include moving the institute out of the school of engineering where it is currently housed, and finding funding for a chair and for additional high caliber researchers across different disciplines, such as computational biology, cancer biology and blood cancer biology. Resulting research would have the potential to be spun off into start up companies. Jain foresees collaboration with area hospitals, where they work with the Genomics Institute to analyze patient data, improve diagnostics, deliver better treatments and cut their costs by 50 to 90 percent. In his opening remarks, Haussler championed the importance of keeping the human genome open source. Today, information is being siloed in medical institutions as private libraries, unavailable to other researchers. To illustrate this, Jain selected from one of many projects, the Global Alliance for Genomic Health and its 300 members. “It looks to build a technology, a data accessibility platform, so that the data that are sitting in hospital, never leave the hospitals, but can be interrogated by people outside of the hospital,” he said. Patient privacy stays within the hospitals, and HIPPA and other health and privacy regulations are followed.